Beware of cryptojacking. Learn how to prevent it. Your computer might be at risk and you might not be aware of it. How is it possible? Yes, it is possible because of Crytojacking. Now comes the question of what is cryptojacking all about and how you are going to prevent your computer from it? First let me make you understand what is cryptojacking? Cryptojacking is a cyber attack, whose purpose is not to steal any important data from your device, rather to mine cryptocurrency when you are ignorant of it, by operating the processor. Hackers, instead of using any particular cryptomining computer, use cryptojacking to enter other people’s device and starts cryptomining operations without bearing much cost. You must be thinking now, how cryptojacking is carried on? 1. By clicking on any malicious link sent via email, it loads the cryptomining code on the device directly, and once the code has been installed, hacker starts working while staying in the background of the system. 2. Another way is just by injecting a java script code through the webpage or the ad pop-ups that are visited by the victim and once clicked it automatically starts executing cryptocurrency mining on the user’s device, when it is idle. 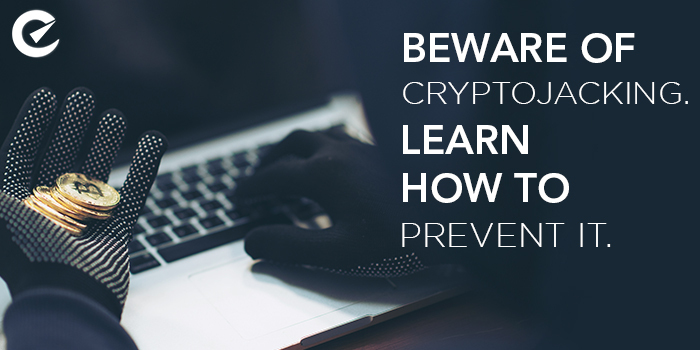 It is very difficult for the victim to realize if their device has been cryptojacked or not. The early sign user gets only when their processors are getting slow and taking longer time to execute any work. The code runs intricate mathematical problem on the victim’s device and sends the report directly to the server that is controlled by the hackers. Although nobody has got any perfect idea regarding the amount of cryptocurrency mined by cryptojacking, the fact cannot be denied that the practice of cryptojacking is increasing surprisingly. Webpage based cryptojacking is spreading at an alarming rate. Researchers have found at present around 33,000 websites are running crypto mining codes. The obvious reason behind cryptojacking’s gaining popularity is that the hackers are able to earn more money at minimum risk. Cryptojacking is cheaper and more profitable than ransomware. Hackers can mine cryptocurrency from all the devices that have been infected, whereas, in case of ransomware hackers need to make payment to the people involved in infecting the devices. Also, mining cryptocurrency earns money continuously. Also, the risk attached with cryptojacking is much less than the risk attached with ransomware. Cryptojacking can remain undetected for a longer period, since the codes are not stored on the devices. Even if it gets detected it is quite difficult to know its main source. The victim has nothing much to do even after the threat gets identified, because the hacker didn’t steal any data or information. Hackers give preference to unidentified cryptocurrencies which will make tracking of illegal practice very difficult. It is impossible to avoid cryptojacking malware completely but reducing the damage caused by cryptojacking is always possible. Since it is manually difficult to detect whether the victim’s device has been cryptojacked through email or website browser it will be a clever decision to install a good antivirus for protecting the system from ransomware, malware, including anti-spam and anti-phishing filters for email. Using cloud-based platform to keep a back- up of all the files is very helpful as it protects the data in every worst situation. If, the system gets infected continuous monitoring the performance of the system is beneficial. The system may be restored again with the backed-up files for better performance. Any IT service provider can scan the software registries for measuring the performance of the system and remove the code from the device for better performance. Previous PostPrevious What can be the consequences, if you deactivate Facebook for some time?